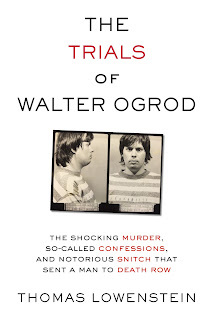 Thomas Lowenstein’s new book, The Trials of Walter Ogrod, reveals explosive new evidence in a Death Row case from 1988. 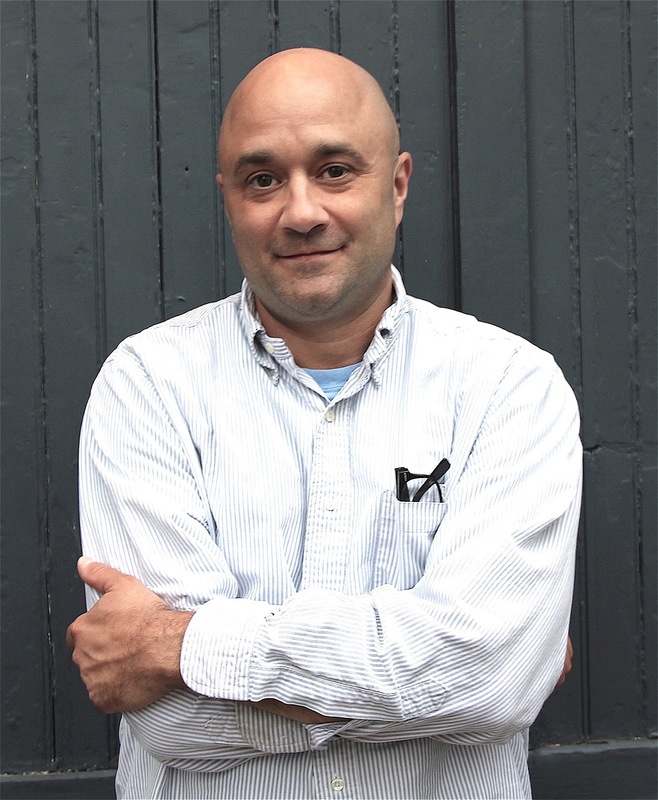 Founder of the New Orleans Journalism Project and former policy director and investigator of the Innocence Project New Orleans, Lowenstein is also the son of the late U.S. Representative Allard Lowenstein who was murdered in his Manhattan office. Stay Thirsty Magazine visited with Tom Lowenstein at his office to talk about his new book and about his views on the criminal justice system. 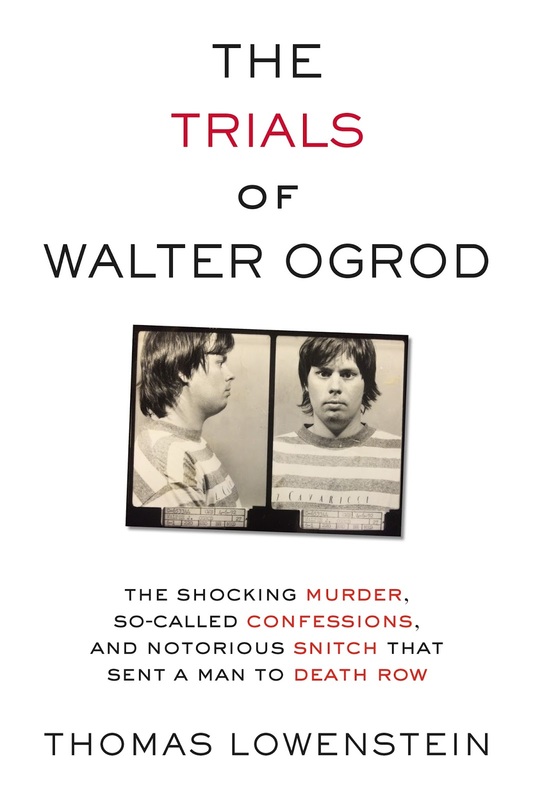 STAY THIRSTY: In your new book, The Trials of Walter Ogrod, you investigate the 1998 murder of four-year-old Barbara Jean Horn and the man convicted of the crime. After going through an exhaustive exploration of that case, how do you feel about the American criminal justice system today? THOMAS LOWENSTEIN: When I started working on the book I was aware of the significant problems in our criminal justice system, and aware of the lengths district attorneys and police would go to in order to win cases (as opposed to simply seeking justice, which is supposed to be their job). Nevertheless, in working on this book. I uncovered behaviors that were shocking to me—particularly the use of jailhouse snitches. The snitch in my book, John Hall, was used repeatedly by the DA’s office in Philadelphia (and surrounding counties) to get convictions in cases without any other evidence—and this isn’t me saying this, I have letters of support for him from several DAs in the area stating that without him they had no case or that he took a sure loser case and made it into a winner. Later, when I got John Hall’s own papers, proving he lied in the Ogrod case, and asked the Philadelphia ADA who’d prosecuted Ogrod about them, she said John Hall was a liar and she’d never used him. Hall was a liar, that part is true, but the fact is she and others in her office had used him many times. The ADA wouldn’t answer the question of why, if she knew he was a liar, she used him and stood by the convictions he’d earned for her office. So while I can’t say I was shocked that innocent people end up on death row, there is something shocking about sitting in a room with someone who put an innocent man on death row, admits that the snitch she used to do it was a pathological liar, and yet refuses to even consider the possibility that she convicted the wrong man. To me, this was as pure a case of “win at all costs” as could be imagined. And once you see that kind of callous indifference in person, it changes your view. I still understand that the vast majority of people in the criminal justice system do their jobs honestly and to the best of their abilities. But it seems the ones who make it to the top of the law enforcement ladder—the top ADA’s, DA’s, and judges—are usually the ones who win at all costs. This appears to be changing slowly, some DA’s and DA candidates, like Larry Krasner, who is running for DA in Philadelphia right now, seem to take innocence cases seriously. But convincing DAs that their job is to seek justice, not victory, is, sadly, a long, slow process. STAY THIRSTY: You recount the murder of your father, Congressman Allard Lowenstein, and its effect on you and your family. As someone who has experienced such a grievous loss at the hands of another, how do you personally feel about the death penalty? THOMAS LOWENSTEIN: I have always opposed the death penalty, and it has nothing to do with sympathy for murderers. They deserve whatever we want to do to them, but we deserve better for ourselves. I learned this the hard way, wrestling for years with a desire to kill the man who killed my father. But all I was doing was ruining my own life, and killing him wasn’t going to make that any better. The death penalty is the same on a societal level—we waste millions of dollars and (cumulatively) hundreds of years fighting these cases in court so that we can, a few times a year, give a murderer what we think he deserves. This makes us all worse off. We should spend that time and money, instead, on things that actually help reduce the number of murders and help victims heal. It’s one thing the prosecutor in the Ogrod case and I agree on—she told the jury that if ever a crime deserved the death penalty, the crime of killing a child, as Ogrod was charged with, deserved it. I agree. Ironically, she made this claim while sending an innocent man to death row based on the word of a snitch she herself said was a liar. So the true costs of the death penalty go on one side of the scale, and killing innocent people is one of them. Would I shoot the man who killed my father if it meant the innocent person next to him got killed, too? Would you? One more point: it’s not clear at all that the death penalty actually helps victims feel better. I’m not pretending to speak for all family members who’ve been through this, but I know many who feel the same way I do, even some who have had the murderer of their family member executed only to realize that after the initial feeling of satisfaction it didn’t help them feel better at all. Killing the man who killed my father might’ve made me feel satisfied for a few minutes, like an execution probably does for some people, but the cost is way too high. STAY THIRSTY: Does the truth ever come out at trial? THOMAS LOWENSTEIN: Yes, I believe it can and even does in many cases. Trials are made up of the stories told by the two sides, and true stories can come from either side if the lawyers involved are ethical and play by the rules. But while it is the defense’s job to throw up any defense they can and thereby force the state to prove its case before putting someone in jail or even killing them, the prosecutors are supposed to seek justice—in other words, the truth. So when prosecutors lie or hide evidence or ignore evidence, they subvert our process in the most fundamental way imaginable. This is the biggest threat to the truth coming out at trial, and it happens far too often, without any real chance of consequences for the DAs who do lie. STAY THIRSTY: In our headline news society, is justice fairly administered or does public pressure and public opinion often sway the outcome? THOMAS LOWENSTEIN: It’s an interesting mix. Justice can be fairly administered and sometimes is, but in cases where it has not been public opinion can sway the outcome. Judges and lawyers like to tell you public opinion it doesn’t matter, but I’ll give you a small example of how it can: The judge who is currently deciding whether Walter Ogrod will get a new trial or not, Shelley Robins-New, worked in the DA’s Homicide office at the time of his first trial and was possibly even in the courtroom rooting for his conviction when the mistrial happened. At the same time, her office was using the snitch John Hall in multiple cases. She never mentioned this conflict of interest until, just this year, she was contacted by a TV reporter about it and my book came out. Then, at a hearing earlier this year, she explained on the record that she’d worked in that office but hadn’t worked on the Ogrod case so it didn’t matter. (She pointedly did NOT say whether she’d worked on other cases with the snitch, which was the more important question.) Also at that hearing, the DA’s office finally admitted that there were issues with the Ogrod case that deserved an evidentiary hearing. I believe that knowing that publicity was coming was at least part of why this judge and the DA’s office changed their tune on these issues. Judge Robins-New is up for re-election, by the way, and I hope people in Philadelphia who are considering their vote will look at her record on this case, which demonstrates a profound lack of concern about a shocking wrongful conviction and her willingness to support her old boss, Lynne Abraham, and her old colleagues at the DA’s office over any sense of actual justice, and vote against her. But I know elections usually work the other way—the “tougher” a judge is, the more likely they are to win, even if being “tough” means innocent people stay in prison. STAY THIRSTY: If you were on death row, how would you go about proving your innocence? THOMAS LOWENSTEIN: This highlights one of the great ironies of our justice system right now, and one that I was not aware of when I started this project: while death row inmates are given lawyers for their appeals, those sentenced to Life Without Parole (LWOP) do not. So if you’re going to be convicted of murder, you’re better off going to death row because at least that way you’ll have lawyers. I remember the first time I talked to Walter Ogrod about the possibility that he could have the death sentence lifted and be put back in general population and he was adamant that he didn’t want that to happen. I was surprised at first, because it’s generally viewed as a “win” for lawyers to get a death sentence overturned and changed to LWOP. And it may be for guilty killers who’d rather live in prison than die. But for innocent folks this can just mean they sit in prison without lawyers for the rest of their days. I even interviewed a Philadelphia lawyer who told me he’s had clients tell him they’d rather “lose” the sentencing hearing and end up on death row than “win” it and get life, for this very reason. How innocent people in prison survive the 10, 20, 30 years it takes to overturn even the worst convictions is amazing to me. You have to have enough anger and emotion about your situation to fight every day for years and years and years without letting that anger and emotion destroy you. So many innocent people can’t do it, and just give up. So many more are just eaten up by the anger. The survivors I’ve met have somehow mastered the art of fighting passionately while figuring out inner peace. As someone who spent many years consumed by anger about my father’s murder, unable to come to any kind of peace with myself, I find these men and women to be some of the strongest people I’ve ever met, and the most inspiring.